America’s attitude to humanitarian issues in Russia is starting to resemble that of the BRICS countries, which demonstrably refrain from discussing them. The Kremlin must have seriously depleted its stocks of champagne on the weekend. The much anticipated announcement by the Obama administration of the Russians included on the so-called Magnitsky List no doubt caused President Vladimir Putin and his team to breathe a sigh of relief. Despite heavy lobbying by many US senators, congressmen and human rights groups, the 18-person list features only a narrow circle of officials suspected of involvement in the tragic death of Hermitage Capital auditor Sergei Magnitsky. Not only does it not contain any bigwigs from the Russian State Prosecutor’s Office or Investigative Committee, it is significantly shorter than the original Magnitsky List presented by senator Benjamin Cardin, which contained the names of 60 people allegedly involved in stealing 5 billion rubles ($160 million) in fake tax refund claims and then in de facto torturing and murdering in a Moscow jail the hapless auditor who uncovered the crime. The message from the White House to Moscow is very clear: “It’s business as usual.” President Barack Obama and his team have all but abandoned any pretence of concern over the Russian authorities’ assault on human rights and freedoms. I was in Washington when the list was made public, and saw even some of my Democrat friends shocked and saddened by the decision. However, if one looks at the current US administration’s record on Russia, this decision should come as no surprise. Ever since the failure of the famous (or infamous, depending on one’s political vantage point) “reset” policy between the two countries, all the White House has wanted to achieve was to launch the so-called “Reset-2.” Obama was silent when the Russians kicked USAID out of the country. He did not say a word last year when, in response to the passing of the Magnitsky Act, the Kremlin banned adoptions of Russian children by Americans. He has ignored a massive government campaign against NGOs (including those funded by grants from US institutions), which are now forced to register as so-called “foreign agents” if they receive any funding from abroad, or face exorbitant fines and possible closure. In fact, America’s attitude to humanitarian issues in Russia is starting to resemble that of the BRICS countries, which demonstrably refrain from discussing them. Political analysts in Washington say that Obama’s main goal is wrestling yet another nuclear arms reduction treaty from Putin. It seems the US president has set himself the goal of living up to the promise of his completely undeserved 2009 Nobel Peace prize. His obsession with disarmament smacks of the 1960s and 1970s leftist politics that formed his worldview. Paradoxically, and despite Obama’s image as an idealist, it also demonstrates a degree of cynicism that should make Henry Kissinger and other American foreign policy “realists” proud of their unexpected follower in the Oval Office. 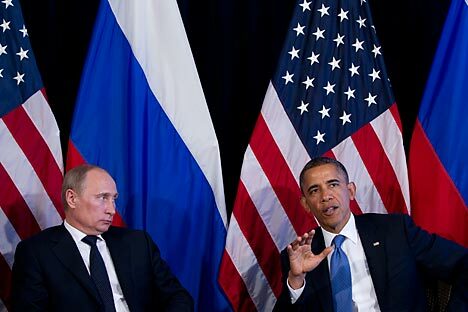 However, what is also revealed is Obama’s astonishing naivety in dealing with the Kremlin. Putin despises weakness in people, and from his point of view, Obama is a weakling who presides over the US withdrawal from global politics. To get the Russian president’s acquiescence in his grand disarmament plans, he’ll have to try harder to earn Moscow’s benevolence.